Essentially, Lex creates the first Nuclear Man in his penthouse using nuclear power. A Frankenstein’s Monster-type creature is created. 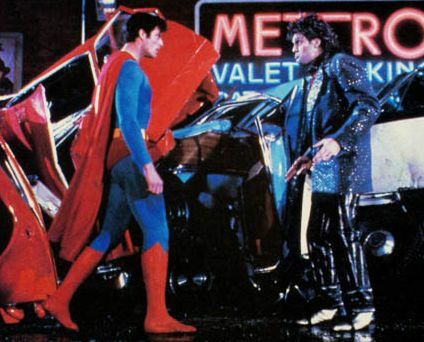 This leads into a scene in which the first Nuclear Man falls in love with Lacy Warfield (played in the movie by Mariel Hemingway) and encounters Superman outside a nightclub in downtown Metropolis. Here’s a still of that showdown. Here’s a clip from YouTube where you can see some of the battle between Superman and Nuclear Man #1. It looks interesting. I’m not sure I like the realization of Nuclear Man #1. And it seems like he gets in a few shots against Superman but then it seems like Superman just straight up murders the guy by batting him into the electrical pole. Was Supes aiming for the pole to electrocute him? That pole was MILES away from the nightclub. It’s confusing and weird. I sort of see why it was cut. There’s also more scenes involving Lacy Warfield trying to get Clark Kent to date her and more scenes involving Clark getting sick after being scratched by the second Nuclear Man. Oh, and Nuclear Man #2 actually literally transforms into a nuclear missile in order to incite nuclear war on Earth. Yeah, that happens. It’s his plan. Nuclear Man, finished with his “fun” in China, fled back into space. Before Superman followed him, he repaired the damage Nuclear Man had done to the Wall. It had taken mankind years to build that section of it. It had taken Nuclear Man only a few minutes to destroy it. Superman repaired it in a matter of seconds and then shot into the sky after his enemy. It had all happened so fast, the tourists weren’t sure it had happened at all. Overall, this book is a fun read. But I think the movie is a fun watch. Wacky, zany, completely over the top and ridiculous. But fun. And at 144 pages, it’s a quick read. This entry was posted on June 20, 2013 at 8:00 am and is filed under books, comic books, movies, Superman with tags Book Report, books, comic books, DC Comics, Movie Novelizations, pop culture, reviews, Superman, Superman Week. You can follow any responses to this entry through the RSS 2.0 feed. You can skip to the end and leave a response. Pinging is currently not allowed. I think that cover is kinda awesome… in a terrible way.